George Walker Bush was sworn into office as the 43rd President of the United States on January 20, 2001 , with a minority of the popular vote, after a contested election debacle which was reviewed up through the Supreme Court. A detailed timeline of events notes that on December 13, 2000, the President-elect pledged in his acceptance speech "to deliver reconciliation and unity to a divided nation." He gained a second term in November 2004. 2 Bush burnishes his "conservation credentials"
5 Bush: "I'm the commander guy"
6 Bush the "Decider": "I'm the decision-maker"
George W. Bush was born July 6, 1946, in New Haven, Connecticut, to parents George H.W. Bush and Barbara Bush. Bush spent some childhood in Midland and Houston, Texas. "He served as managing general partner of the Texas Rangers until he was elected Governor on November 8, 1994, with 53.5 percent of the vote. He became the first Governor in Texas history to be elected to consecutive four-year terms when he was re-elected on November 3, 1998, with 68.6 percent of the vote." Texas Governor: January, 1995-January, 2001. Bush married Laura Welch, a "former teacher and librarian, and they have twin daughters, Barbara and Jenna." Bush burnishes his "conservation credentials"
"President Bush used highly choreographed [opinion] photo-ops in Maryland in an effort to 'burnish his conservation credentials.' He looked 'slightly askance' with a screech owl on his hand, remarking, 'Cute little fellow.' He also joked that he loves fishing, but 'the Secret Service won't let me go hunting' with Vice President Cheney anymore." Bush: "I'm the commander guy"
Bush the "Decider": "I'm the decision-maker"
See MSNBC video of Bush speaking to reporters. See "The Decider: 'People Listen To Petraeus, Not To Me'," Think Progress, September 20, 2007. Also see related troop surge in Iraq. "Bob Woodward is wrong. Colin Powell is wrong. The National Intelligence Estimate is wrong. Brent Scowcroft is wrong. The retired generals are wrong. Richard Clarke is wrong. The International Atomic Energy Agency is wrong. The United Nations is wrong. Bill Clinton, Jimmy Carter and all the Democrats are wrong. Your common sense and all the news you read are wrong. "George W Bush and his dog Barney are right. The last time a man listened to his dog, people got killed. This time is no different. "—Taylor Marsh wrote October 8, 2006. ↑ "Bush uses photo-ops to ‘angle for conservation stature'," Think Progress, October 20, 2007. 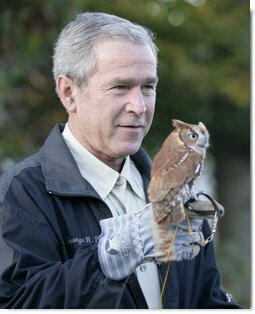 ↑ [http://www.whitehouse.gov/news/releases/2007/10/20071020-2.html News Release: "President Bush Discusses Migratory Bird Conservation Patuxent Research Refuge - Endangered Crane Complex,"] Laurel, Maryland, Office of the White House Press Secretary, October 20, 2007. George W. Bush, his family and many members of his administration have been friendly towards tobacco companies. Bush's chief political advisor Karl Rove carried on a dual role as a paid lobbyist for Philip Morris while also advising George W. Bush when he was Governor of Texas. Ex-Wisconsin Governor Tommy Thompson, Bush's appointment to head the Department of Health and Human Services, was also friendly to tobacco companies, having taken several trips funded substantially by tobacco companies, according to CorpWatch. After his failed reelection bid, George H.W. Bush, (G.W. Bush's father) rode in Philip Morris corporate aircraft, gave talks on behalf of PM, accepted honoraria paid by the cigarette maker and helped PM promote its Accommodation Program. As of June 2007, President Bush has refused to sign onto the World Health Organization's Framework Convention on Tobacco Control, a global treaty designed to reduce the toll of death and disease caused by tobacco worldwide. As of June 2007, 148 countries had signed the treaty. "He was a stock character in 19th-century fiction: the wastrel son who runs up gambling debts in the belief that his wealthy family, concerned for its prestige, will have no choice but to pay off his creditors. In the novels such characters always come to a bad end. Either they bring ruin to their families, or they eventually find themselves disowned. "George Bush reminds me of those characters and not just because of his early career, in which friends of the family repeatedly bailed out his failing business ventures. Now that he sits in the White House, he's still counting on other people to settle his debts not to protect the reputation of his family, but to protect the reputation of the country." "As long as political figures aren't willing to disown Mr. Bush's debt the impossible situation in which he has placed America's soldiers there isn't much they can do. "So how will it all end? The cries of 'stay the course' [in Iraq] are getting fainter, while the calls for a quick exit are growing. In other words, it seems increasingly likely that the nation will end up disowning Mr. Bush and his debts. "That will mean settling for an outcome in Iraq that, however we spin it, will look a lot like defeat -- and the nation's prestige will be damaged by that outcome. But lost prestige is better than ruin." On March 11, 2004, syndicated columnist Marianna Means wrote that "Bush loves to tinker with [the] Constitution." "Bush also didn't say that this is the seventh amendment he has embraced, reflecting breathtaking contempt for the principles embodied in the work of our Founding Fathers." "In all, Bush and first lady Laura Bush have invited at least 270 people to stay at the White House and at least the same number to overnight at the Camp David retreat since moving to Washington in January 2001, according to lists the White House provided The Associated Press. "Some guests spent a night in the Lincoln Bedroom, historic quarters that gained new fame in the Clinton administration amid allegations that Democrats rewarded major donors like Hollywood heavyweights Steven Spielberg and Barbra Streisand with accommodations there." "Bush's overnight guest roster is virtually free of celebrities - pro golfer Ben Crenshaw is the biggest name - but not of campaign supporters. "Mercer Reynolds, an Ohio financier, former Bush partner in the Texas Rangers baseball team and former ambassador to Switzerland. Reynolds is leading Bush's campaign fund-raising effort. He was a guest at the White House and the Camp David retreat in Maryland's Catoctin Mountains. "Brad Freeman, a venture capitalist who is leading Bush's California fund-raising effort, has raised at least $200,000 for his re-election campaign and is also a major Republican Party fund-raiser. Freeman stayed at the White House. "Roland Betts, who raised at least $100,000 for Bush in 2000, was a Bush fraternity brother at Yale and a Texas Rangers partner. Betts stayed at the White House and Camp David. "William DeWitt, a Bush partner in the oil business and Texas Rangers who has raised at least $200,000 for Bush's re-election effort, stayed at the White House. "James Francis, who headed the Bush campaign's 2000 team of $100,000-and-up volunteer fund-raisers and was a Bush appointee in Texas when Bush was governor. Francis was a White House guest. "Joseph O'Neill, an oilman and childhood friend who introduced Bush to Laura Bush and raised at least $100,000 for each of Bush's presidential campaigns, stayed at the White House. "Colorado Gov. Bill Owens and New York Gov. George Pataki, who each raised at least $200,000 for Bush's re-election campaign, were White House guests. "James Langdon, who raised at least $100,000 for Bush, is a Washington attorney specializing in international oil and gas transactions. Langdon, whose clients include the Russian oil company LUKOIL, is a member of Bush's foreign intelligence advisory board and served on Bush's 2000 presidential transition team on energy policy." Jonathan Alter asked in the November 22, 1999 issue of Newsweek "Is George W. Really Ready? A leader with a gentleman's C may no longer cut it in a world where speed and smarts rule." ". . . Bush wouldn't have to worry so much about performance if he had a compelling life story to give him gravitas. Unfortunately for him, he's had the least eventful personal history of any major political figure in modern memory. Until his 1994 election as governor of Texas, Dubya lived deep in his father's shadow. President Bush was an academic and athletic star at Andover and Yale, a war hero and successful oilman. George W. was an academic slacker at the same schools, a mediocre athlete, a member of the Texas Air National Guard during the Vietnam War and an unsuccessful oilman. Before politics, he was probably best known for the nicknames he attached to people--a hipper and more sarcastic version of the Saturday Night Live character who gives everyone he meets a name while 'makin' copies.' . . ."
In Bob Woodward's book, State of Denial, he recounts a conversation that Bush reportedly had with Prince Bandar bin Sultan, the Saudi Ambassador to the U.S. and family friend to the Bush clan. In 1999, when Bush first thought of running for president he confided to Prince Bandar, "I don’t have the foggiest idea what I think about international foreign policy." "Forget 'compassionate conservatism.' While you're at it, toss the 'reformer with results.' Education, taxes, welfare reform -- none of those things really matter. For George W. Bush, one issue matters: loyalty. You're with him or you're not. There's no in-between. It's a lesson that he learned from his mother, Barbara, a fiercely territorial woman who never forgets a slight, and from his father, former president George H.W. Bush. George W. has been fiercely protective of his father, and he believes part of the reason his father served only one term in the White House was the lack of loyalty among his staff members. During the elder Bush's four years as president, W. became his loyalty Doberman. It was George W. who sifted through his father's staffers, demanding that they either commit fully to their father or get the hell out. It was George W. who fired his father's White House chief of staff, John Sununu. The abrasive Sununu, George W. believed, simply didn't have his father's best interests at heart." --Robert Bryce, Austin Chronicle (Texas), March 20, 2000. Includes links to biographies, profiles, news articles, pro- and anti-Bush websites, and more.